Hadar the Ember is the extinguished cinder of a star lurking within the cloaking nebula of Ihbar. Hadar's dull red glow is barely visible in the night sky, as the star slowly burns down into a lifeless, dead cinder. According to the Revelations of Melech, Hadar was once the brightest star in the sky, but during the calamities that led to the fall of the Midan Empire, it surged into a searing brand of light and then faded into a blood-red ember. Hadar now hangs on the edge of annihilation. A herald of Hadar is an avatar of Hadar's dying gasps, a fiendish monster that grows stronger in the presence of living creatures. A herald of Hadar is spawned by its namesake, a dying ember of a star. The herald feasts on life energy, channeling it back to its creator in an effort to avert its demise. Hadar the Ember is one of the two stars cloaked behind the Ihbar Nebula, Hadar's dull red glow is barely visible in the night sky. It was once the brightest star in the sky but during the fall of the ancients it surged, a blinding light seen throughout all reality, then faded to its current state. A blood red ember, Hadar hangs on the edge of nothingness and hungers constantly for the life it once had. Its dying gasps drift through the void of space and reaches many ears. Its only wish is to feed, devouring the energy of anything within its feeble and withered grasp. Hadar shares its home with Acamar, a great corpse star that has collapsed in on itself in its hunger and now seeks to devour the rest of the universe. It feeds on the light and matter of nearby celestial bodies, pulling them ever closer to its empty core, The Maw is kept in check only by the slowly expanding Ihbar Nebula which it calls home. The Ihbar Nebula is in itself a living being, a grasping expanse of pure darkness. Star pact warlocks often dream of the eternal blackness as it spreads to devour all things. Ihbar speaks to many, inviting them to join it, to make it whole, to make everything whole, a single mind for all the universe, devoid of pain and loneliness and hunger. Its origin lost in the infinite expanse of time, a primordial symbol, a mystic sign. When invoked by a bearer who is favored by Hadar, a primordial symbol flares with an invisible flash in a 100-foot radius burst, which has the following effects on those in range. • Creatures with 40 Hit Dice or fewer with the extraplanar subtype are returned to their home planes as though by the banishment spell, regardless of spell resistance and with no save permitted. This includes extraplanar entities possessing other creatures. • Any non-extraplanar entities possessing other creatures or extraplanar entities with more than 40 Hit Dice possessing other creatures are driven out of their hosts. • All eidolons, medium spirits, and phantoms are dismissed. • All evil and good aligned spells in the area are dispelled as though by greater dispel magic, with no caster level check required. • All abjuration effects and magic circles in the area are similarly dispelled. • All creatures are blinded for 1 round (Reflex DC 22 negates). Other creatures and objects within the area are otherwise unharmed. When the symbol is activated, its wielder takes 2d6 points of Intelligence, Wisdom, and Charisma damage, rolled separately for each ability. 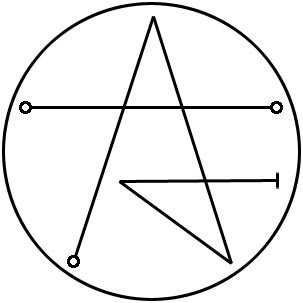 The primordial symbol then collapses in on itself and vanishes, only to reappear unharmed in a distant land or world. I am here to offer guidance, salvation, and blessing to those who are lost. Now, get on your knees and pray for the Crimson Death. Drink this soup. As you can see, the pot is now empty. However, the soup that was inside hasn't just vanished. It has become a part of you. Part of your flesh and blood. It has neither deteriorated nor died. It simply ceased to be soup in a pot. Combining with something greater, it is reborn as something completely new. That is what I mean by devotion. But we are not soup. We can choose who we devote ourselves to. We just need to think clearly about it. What is a more desirable devotion? There is no path to victory unless we devote ourselves, and become one with Hadar. To be one with our god is to leave behind any notion that you are an individual. With this in mind, do you accept our god as your savior? Are you willing to sacrifice yourselves to him? Let us pray! Let us call on the name of Hadar! Come forth, the Crimson King, whose name is Hadar! Come forth Hadar! The Wings of Death! Come forth! The Wings of Death! Bring us a glorious end! Help us achieve ultimate victory with our flesh and blood! Oh, great Hadar! Bring us victory! Bring us to a glorious end! The one that shall devour all. The King of the Void. This universe only exists and has value as a tribute and a sacrifice to Him. Embrace this demise. There is no greater blessing. The universe is finite and will one day be deceased. Then we must seek for rest and glory beyond that final destruction. Life is a series of fears. Release from them and eternal peace are the longstanding desires of every being. Sadness and pain are curses inflicted on all living things.